Text reader is a stand-alone application that offer user friendly environment which makes your documents text into speak able format. Program has an option to convert PDF text, RTF, News, Article, Clipboard, Web-page, Ms-Word content, e-mail, e-Book text into appropriate audio format .User can save file in audio format and can be listen later. Tool permitted to listened store data in several media player as per your choice. You can browse required file and perform operation like speak, stop, pause and more. Utility beneficial for improve word pronunciation as well as writing ability point of view. * Application converts document text into video format. * You can change PDF file, clipboard, e-mail, eBook, MS-Word text, Web-page, Article and more in audio format. * Document text can be listened into different media player as per your choice. * Does not required extra technical support software like adobe acrobat etc? * You can save file into WAV format and listen later. 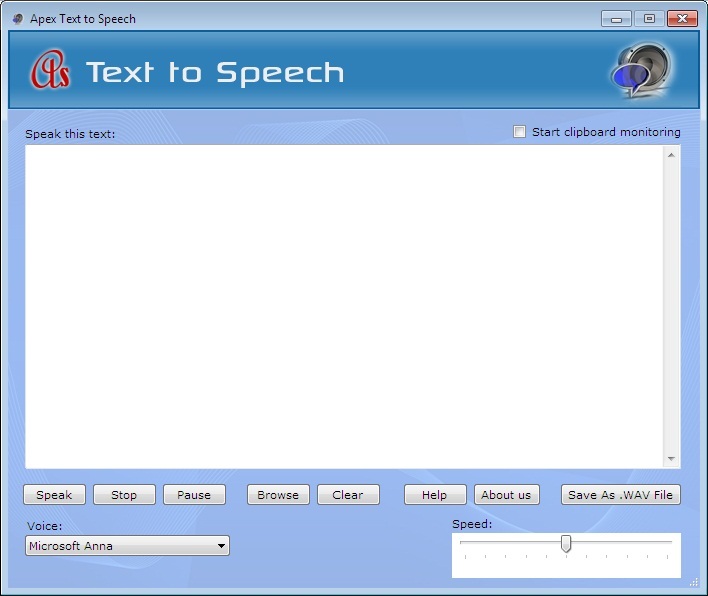 * You can recover own writing ability through this program. * You can use both 32 and 64 bit operating system. * You can work with all Window operating system like Vista, XP, NT, 2000, 7 and more.